Behold, the infamous Jaques Torres chocolate chip cookie recipe, as adapted from the New York Times. The cookie that needs more than a pound of Valrhona feves, chocolates shaped into little disks (priced at a whopping $24.99 per pound!!!). The cookie that doesn't even provide any instant gratification, because, after mixing the batter together, you need to allow the dough to rest and chill in the refrigerator for 24 FREAKING HOURS. Do you know how long that is to wait for a cookie?! 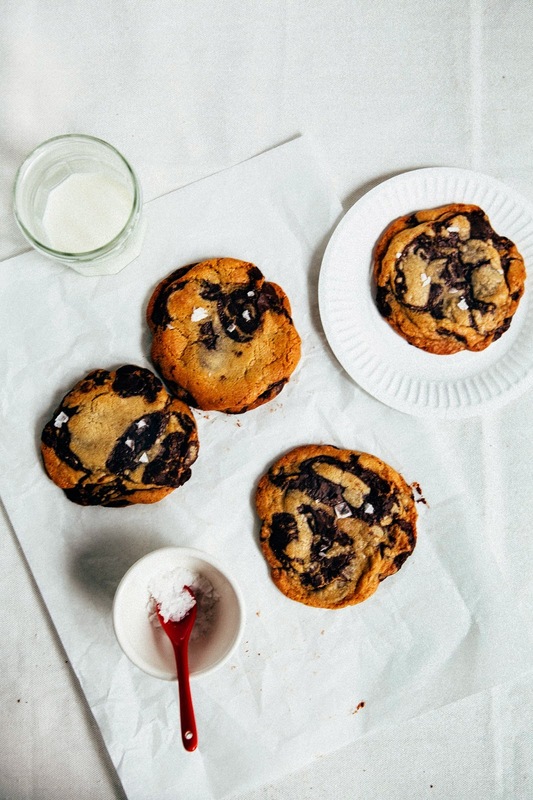 This is officially the world's fussiest chocolate chip cookie recipe, I kid you not. In my defense, it appears that I'm not the only one who's all hot and bothered by this cookie recipe. The Kitchn, a highly reliable and much trusted food blog, once devoted an entire series of articles around the recipe. 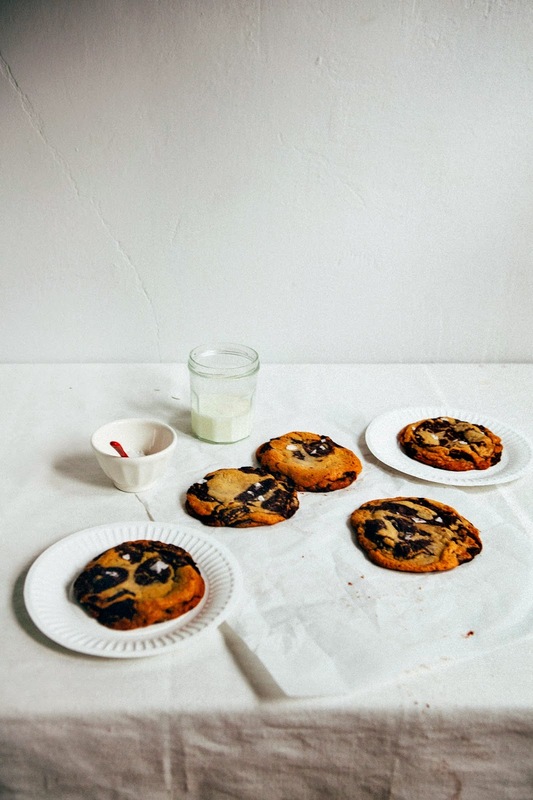 Because along with the instructions on how to make the cookie, the New York Times published a lengthy, three-page-long article gushing on about what makes a chocolate chip cookie so perfect, concluding that Jaques Torres' version is one of the most perfect around. Why? It adheres to the ideal chocolate to dough ratio (40:60 is the golden ratio, according to the article). 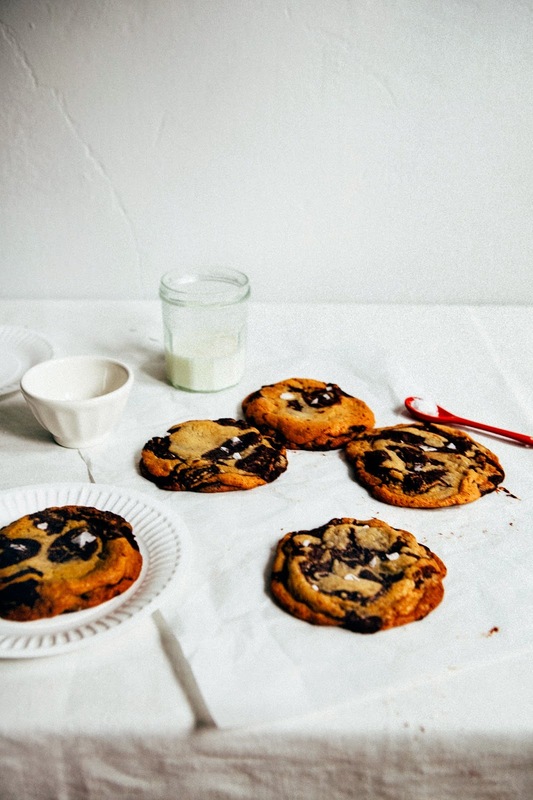 Each cookie is huge, weighing in at 3 1/2 ounces and roughly the size of your palm. Due to its larger size, the cookie actually encompasses three different textures: crispy on the outsides, chewier as it gets closer to the middle and a magical center that manages to be soft, chewy AND crispy all at once. And finally, that long resting period that I keep bitching about is apparently the cookie's ultimate secret weapon: 24 hours allows the flours in the recipe to absorb all the oils and fats from the other ingredients, melding together to create a more intense, richer cookie flavor complete with toffee and caramel notes. This is a legendary, mythical cookie. So it's no surprised that somebody who's even somewhat invested in baking has heard of the recipe. I myself even have a weird history around it. The recipe was first published in the summer of 2008, right at the start of my senior year of college. As a way to procrastinate on my terribly boring and dry economics thesis (seriously — I wrote about ways to apply a taxation model to reduce airport congestion, what in the hell was wrong with me, could I pick a more boring topic?!!! ), I decided I wanted to bake some chocolate chip cookies. Of course, the New York Times recipe came up pretty quickly in my Google searches. A quick browse through the ingredients list — which required two types of flour, and those damn chocolate disks — literally had me going "NOPE." I'm pretty sure I ended up eating cookies from premade Nestle Toll House Cookie Dough that night. Fast forward another few years later to the fall of 2011, when I was just getting this blog up and running. I'd just moved to Denver, Colorado, and had a hankering for chocolate chip cookies. I did my usual Googling of recipes, and of course, stumbled back into the New York Times recipe. This time, I actually went out and found the damn disks but made one fatal error — I hadn't read the recipe beforehand and therefore hadn't realized that the dough needed 24 hours to rest. When I did find out, I believe I swore loudly, cursing the recipe and making these guys instead (check out that link for vintage Hummingbird High, complete with cell phone pictures and now-expired Instagram filters). I wanted my cookies NOW, you see. I suppose I could have just ignored the instructions and made them without the rest period, but honestly, that's just not the kind of person I am. I usually follow recipes to a TEE, unless I've purposefully decided to deviate from its instructions beforehand. So, now it's 2015. I've been wanting to make that recipe for almost seven years, ever since I first found out about the recipe back in 2008. And this time, I did everything absolutely by the book, following the ingredients and instructions perfectly. I weighed everything out and used the best ingredients I could possibly find — cake and bread flour from Bob's Red Mill, cultured butters from Organic Valley, real chocolate feves from Valrhona, and flaky gourmet sea salt. I chilled the dough overnight, waiting a full 24 hours before scooping out dough balls and actually weighed each one to make sure they matched the suggested 3 1/2 ounces. And how were the cookies? Worth every article, hour, and dollar. Every step and ingredient that gave me additional hassle had its purpose after all. The cake and bread flours in the recipe combined to create the perfect texture, giving the cookie a hearty crunch but a tender crunch. The chocolate feves melted just enough to ensure that every bite contained a generous dollop of chocolate. The overnight rest brought out the promised toffee and caramel flavors, as well as notes of brown butter and butterscotch. 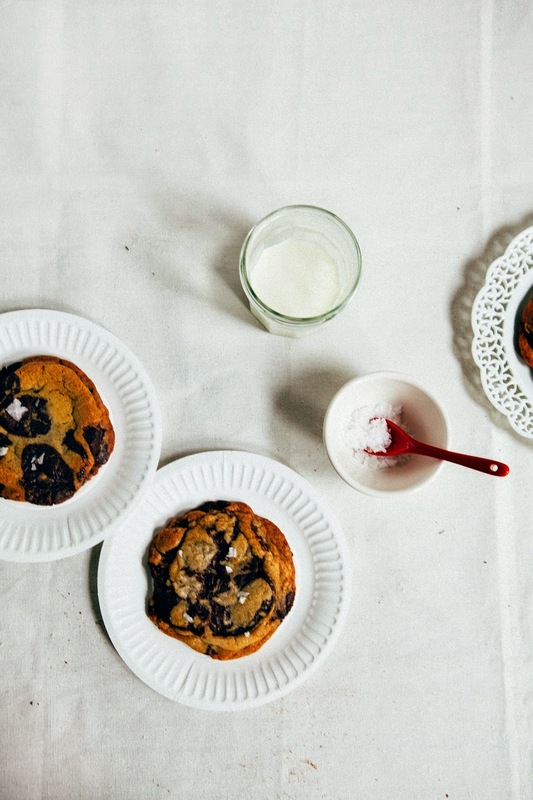 This really, truly is the perfect chocolate chip cookie recipe. If only they weren't such a damn hassle to make. Please, please — no substitutions or exchanges on this one. Follow the listed ingredients and recipe to a tee, or you won't be getting the full experience. The whole point of this cookie is that it's a bit of a pain to make. If you can't be bothered to use the different flours, source the chocolate feves (which are available online or at Whole Foods), or wait overnight, I seriously suggest finding another chocolate chip recipe. There are plenty of other great ones out there. I don't mean that snottily — usually I'm all about making things as pain-free as possible, but again, that's just not the point of this recipe. In a medium bowl, whisk together 2 cups minus 2 tablespoons cake flour, 1 2/3 cups bread flour, 1 1/2 teaspoons baking powder, 1 1/4 teaspoons baking soda, and 1 1/2 teaspoons kosher salt. Set aside. In the bowl of a freestanding electric mixer fitted with a paddle attachment, combine 1 1/4 cups unsalted butter, 1 1/4 cups light brown sugar, 1 cup plus 2 tablespoons granulated sugar and 2 teaspoons pure vanilla extract. Cream on medium-high speed until very light and fluffy, at least 5 minutes. After 5 minutes, add 2 eggs, one at a time, only adding the next egg when the previous one is fully incorporated. Reduce speed to its lowest setting and add the dry ingredients (from the 1st step) and mix until just combined — do not mix for more than 1 minute. At this point, it's okay to have a couple flour streaks left in the dough. Turn off the mixer and scatter 1 1/4 pounds bittersweet chocolate feves into the bowl, and use a rubber spatula to incorporate them throughout the batter. Press plastic wrap against the dough and refrigerate overnight, at least 24 hours. Once the dough has been chilled for 24 hours and you're ready to bake the cookies, center a rack in the oven and preheat the oven to 350 (F). Prepare a baking sheet by lining with parchment paper or a nonstick baking mat. Working in batches, use a cookie dough scoop or an ice cream scoop to measure out four 3.5 ounce mounds of dough, making sure to turn any chocolate pieces that are poking up horizontally to make for a more attractive cookie. Sprinkle lightly with sea salt and bake until golden brown but still soft, around 18 to 20 minutes. Transfer the baking sheet to a wire rack for 10 minutes, then use a metal spatula to carefully transfer the cookies onto another rack to cool for another 10 minutes. Repeat with remaining dough, baking in batches of 4 cookies. Eat warm. Love your blog! I have made this recipe several times and tweaked it to suit me: no bread flour, organic milk and dark chopped chocolate bars and less of it, rested it up to 48 hours. I also make them smaller as such giant cookies just don't appeal to me aesthetically. However: they are divine. Even with my tweaks they are the best chocolate chip cookies anyone I've fed them to has ever had. Worth the wait. Good for you for making them! 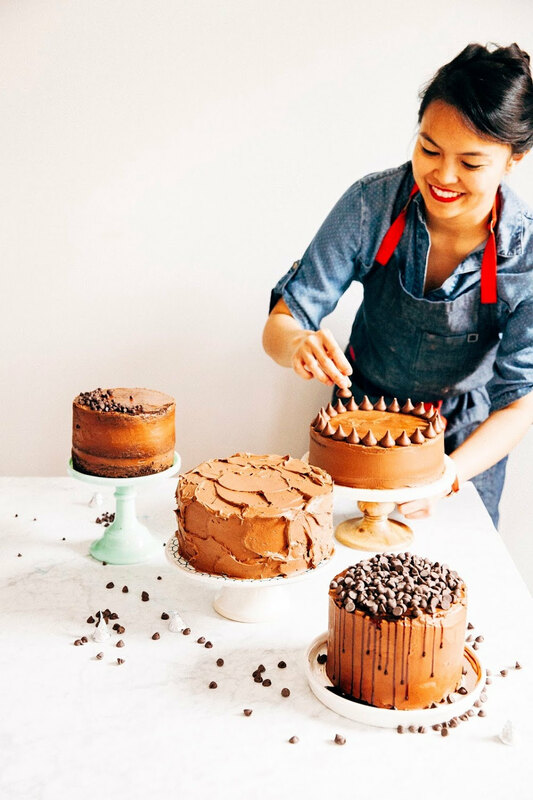 Oh interesting — do you just use all-purpose flour instead, or do you use all cake flour? Thanks Stephanie! 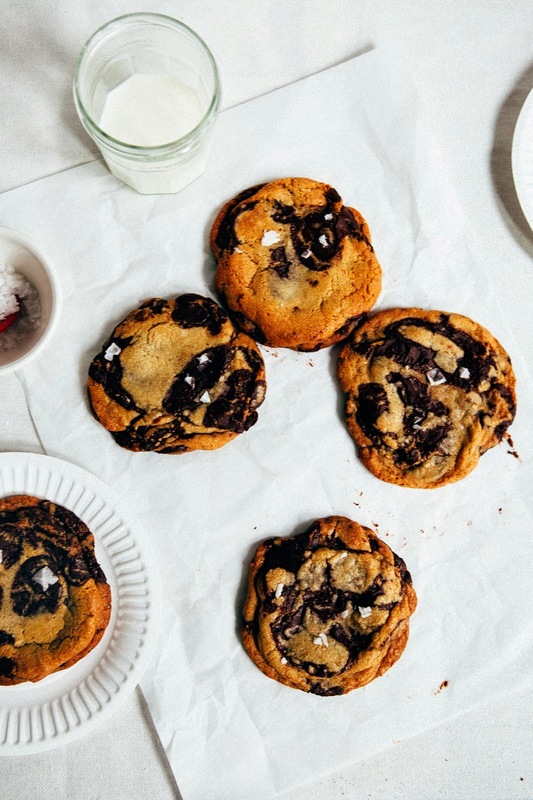 Not gonna lie, these cookies came from YOUR post giving me a chocolate chip cookie craving! lol we've come full circle. I'm with you, I wanted these to be mediocre at best SO. FREAKING. BADLY. Alas, they're actually the best. I've tried dozens of ccc recipes, but they all pale in comparison to these. OMG, yes to all of your comment. It's annoying — now if I want a chocolate chip cookie, I have to default to this really expensive and inconvenient recipe, GAH. I don't think I can go back to any others!!! Wow these look absolutely amazing. There is nothing better than chocolate chip cookies. Yummmmmm. This is definitely the kind of recipe I would try - I am sucker for all things difficult! Any thoughts on adapting it for altitude though, given your history? The kicker is - I am at 10,000 feet, and if I follow this recipe to a tee, it'll flop! Now THAT's a cookie! "Legendary" seems entirely appropriate and I definitely need to give this a go. so funny- i totally agree! i am totally obsessed with CCC recipes-and had tried maybe a billion-and this one is hands down the best. at this point i make them so often, that usually i just double the batch and leave half in the freezer until the need strikes. Well, i think all the pain is totally worth it!!! They look perfect and so - so - so yummy!!!! I've seen this recipe replicated before, but you're rendition looks like the one I'll be putting on my NY resolutions list, at the TOP, to MAKE MORE COOKIES! Even if they are 24 hours in waiting. This recipe! Holy smokes! I too have seen this recipe online and have thought, "No way! Not today!" But I think you may have convinced me to finally give this recipe a try. I've been stuck on Izy Hossack's Chocolate Chip Cookie recipe infused with basil for a bit now. So so good! OMG these look amazing Michelle!! Major love! Yes!!! That's what I've been thinking about doing. I bet you having them in the freezer forever and ever also improves on their flavor. Ahhhh! So honored to have made a place on your resolutions list!!! OMG, I know, right? But it's totally worth it! So I actually ended up making these in batches — a couple on the day of, a couple overnight, 2 nights overnight, etc. The overnight ones were noticeably better. Also, the ones I made 2 days later, and 3 days later... and thenI don't think they lasted more than that. It took me 7 years to finally earn the patience to wait for these babies to rest overnight. Seriously. I LOVE Izy's recipe, but honestly, this recipe is a classic. If only it weren't such a pain to make... but I guess that's what makes it so good? Totally, totally to all of what you just said. Seriously, that's why it took me seven years to make this damn recipe! I think the trick is to *not* really want a chocolate chip cookie, make the dough, forget about it, then have a nice surprise for later. The only problem with that game plan is that... well, I always want a chocolate chip cookie?!! Ugh, I know. It is a little bit ridiculous to pay that much for friggin chocolate. I know they're Valrhona and all, but still. Major eyeroll. Honestly I think you can also use BIG chocolate chips to the same effect (the ones that almost look like disks, if you know what I mean? Something like these guys: http://amzn.to/1KmXpY4), but this recipe had been haunting me for years now and I knew I would be upset with myself if I didn't use all the right ingredients. Thanks Thea! I'm so excited that everybody's really excited about these cookies! I will take $24 dollars worth of these, please. They look freaking perfect, and I'm digging these photos. This is probably the most accurate description of that damn recipe i've read. Those smug chefs and their perfect time-wasting recipes. Ugh. Tastes too good to pass up. They look absolutely fantastic - I am salivating! I too have considered making the recipe ans I think you just sealed the deal. 2015 is the year I finally make these. Thanks for sharing. Kudos to you Michelle for doing what you love! I enjoy your blog because of your writing and your beautiful photos. I love cakes and sweets but don't often make them because... I will eat them all! OOoohhh, this is a tricky challenge. I'm not quite sure because I only ever adjusted recipes at 5000ft; 10,000ft is a whole other ball game! Off the top of my head, I would start by adjusting the baking soda and powder quantities in the recipe by 1/2 teaspoon. 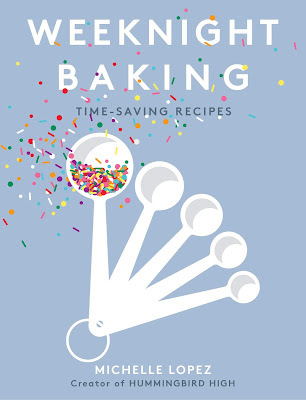 I would also watch the cooking time — these might bake up wayyy quicker. If they still spread out too much, I would add 2 tablespoons of each kind of flour to the flour quantities listed. Heartily agreed. Chocolate chip cookies are one of my favorite baked goods, period. Thanks Sarah! This recipe was definitely on my resolutions list for 2015; so glad I'm inspiring other people to knock it out! Oh god, when I made these, it was over Christmas break and I was by myself since my boyf had gone to spend time with his family. I kept thinking I would bring them to work... but nope. I ended up eating most of them all within the following week... BY MYSELF. Now I'm on this terrible low carb diet and everything's the worst. I know, right? The trick is to make a big batch, bake a few at a time, then freeze the rest of the dough. That way you can always have some when the craving strikes, without having to deal with that pesky 24 hour waiting period! YES! I was just talking about that article with somebody else in the comments. I love, love, LOVE all the meticulous research that went behind that article. Also, the pictures are awesome — you can actually tell what ingredient leads to what effect! Very cool. AHHH so glad you shared your chocolate source!!! I usually just get my chocolate from Amazon or Whole Foods. This site looks AMAZING. There's also a chocolate-specific store in Portland that organizes chocolate this way, but I always restraining myself from going because I always end up spending wayyyy too much money. I just used all-purpose (I live in England) it's not so easy to get cake flour here. But, but, but… I haven’t waited for 24 hours for anyyyything. UGH. These look insanely good… I guess if I just keep making them every other day or so, it will get easier to wait for them. Oh! Me too! Me too! And here I've been thinking I may need to smack down my obsession with this cookie recipe, because it's been taking a perpetual Chrome tab for the last five months. Thanks for making these and chronicling -- now I really have to try them. Maybe I'll shoot for Valentine's Day. I am a chocoholic and this cake looks so fantastic that I can not try it. I also love the creme fraiche. Measure out the all-purpose flour that you’ll need for your recipe. For every cup of flour you use, take out two tablespoons of flour and return it to the flour bin. Throw the cup of flour (minus the two tablespoons) into a sifter set over a bowl. Replace the two tablespoons of flour that your removed with two tablespoons of cornstarch. Sift the flour and cornstarch together. Sift it again, and again and again. The cornstarch and flour need to be well incorporated and the flour aerated. Sift the flour and cornstarch mixture about five times. Look at that! You just made cake flour! Yes! I think for cookies, after beating all the ingredients together, it takes time for flour to absorb the oils from the other ingredients. The longer you wait, the more delicious it will be, no matter what type of cookie. This won't work for cakes though since cakes are more a batter (which needs to be made immediately) versus a dough. Ugh, I know. I don't even want to think about how much I spend on baking ingredients. Hahah, so glad you think my econ thesis is interesting. It was at the time, but now that I think about it, there were definitely other topics I would have preferred to research. Ha, thanks Mom. Maybe I'll make these for you when I'm in Manila. YES. Honestly that is kind of what I want to do with the rest of my life... is that bad? Okay,so I'm a huge Kentucky Bourbon fan and my hubby has been cracking the black walnuts that we harvested last fall. I was fixing my awesome black walnut cake and found this recipe which is VERY similar and OMG....the best of all worlds. I know there are folks that don't care for bourbon and those that don't care for black walnuts. That's okay. All the more cake for those of us that do. BTW I used Buffalo Trace Bourbon and one cup of black walnuts. Mmmm Thanks! I am a ccc fanatic!! I love my tecipe, which I use 3 different chocolate chops and heavy on the vanilla. I am COMPELLED to go get these ingredients and make them!! I had a gastric bypass and still (12 years later) eat VERY little which means what I do eat, I make sure is quality and worth it!!! I will make these cookies mostly in the size required, but will make a few smaller so I can enjoy them!!! Thank you, a million times for this recipe! Thank you Jacques Torres, wherever you are!!!! 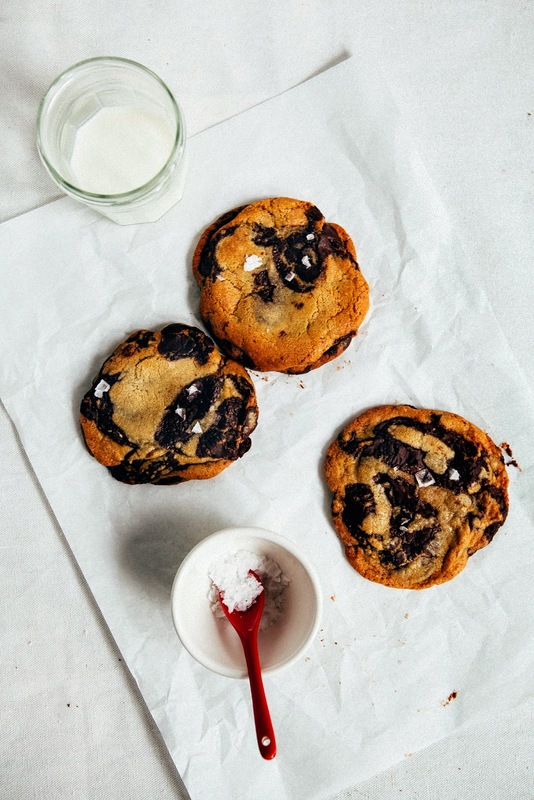 OMG cookies with salt. I want, I want, I want! These look incredibly yummy! My husband would love these. For the chocolate buttercream, is it 3 or 6 oz of cream cheese? Looks beautiful! To take the sting out of the 24 hr waiting period and the $24 pricetag, I usually make the dough on a Thursday or Friday night after work, then bake on Saturday or Sunday. As for the chocolate feves, they can be purchased from Jacques Torres himself at Mrchocolate.com for $14/2lb bag. Hi - I made the dough tonight and saw the vanilla in the ingredient list but not in instructions. I think you may have left it off by accident? I forgot to add it with eggs. I didn't remember until I put dough in fridge. So I then sprinkled on dough log and rubbed it in. Hope.it works! Oh noo! I'm sure it will be fine. Thanks for letting me know, I edited the recipe above to include the vanilla in the instructions. Is this recipe adjusted for high altitude? I've read and re-read but can't tell for sure. I'd like to make this for my son's first birthday party we are having in Denver. Thank you! No, it's not. All my recipes have been at sea-level since 2012, when I moved away from Denver. Sorry! The printed version of the recipe doesn't include adding the vanilla extract! Which I realized after I put the dough in the fridge. So now I have over $24 worth of ingredients and I'm missing the vanilla! Odd there anything I can do to fix this?! The printed version of the recipe doesn't include adding the vanilla extract! Which I realized after I put the dough in the fridge. So now I have over $24 worth of ingredients and I'm missing the vanilla! Is there anything I can do to fix this?! I'm just in tears. I even weighed the sugar. And since I ordered a 2 lb bag of the chocolate I can't even start over. Oh no! I'm editing that now. Sorry about this! I talked to bakernberner (the person who let me know the vanilla was missing initially), and her sprinkling over the dough log and smearing it in worked fine. Hope that helps! My tears were unnecessary. Even without the vanilla, they were amazing. So beautiful and delicious. A success. I think next time I'll shape the dough into logs before it goes in the fridge up make it easier to portion out. Thanks! Yay! So glad that it worked out, even without the vanilla. This cookie recipe really is magical. I've updated both the blog and print version, so hopefully this won't happen again in the future! Thanks for letting me know! I want to try my hand at these but I don't live with my Mom anymore who has the kitchenaid my Dad bought years ago before he passed. He loved baking cookies. Anyway, all I have is myself and a hand mixer. Should I do anything differently or do I really need the stand-up mixer? No, a hand mixer should work fine! You might have to beat the sugar and butter together for a longer time though — do it until they're really fully combined and turn into a uniform, light and fluffy mixture. It helps if you cream it in a deep bowl. Hi! Is there any way to store this cake? If so, for how long? Thanks! Looks amaze-balls! Wow, thats such a wonderful recipe you have shared over here and a big thanks for that. I always love to prepare something new for kids . You are maintaining such a wonderful blog with good list of recipes.